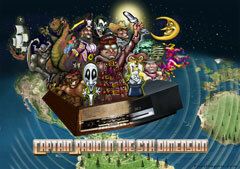 Greetings, Audionauts – Captain Radio here with a review of Spirit Blade: Special Edition. And there you have a taste of the sonic excitement of Dark Ritual, the second installment of Paeter Frandsen’s Spirit Blade Trilogy. This scintillating, edgy PG-13 Christian-oriented sci-fi fantasy series follows the harrowing exploits of Merikk Venndarius, initially a disillusioned, self-doubting “one-hit” musician who very reluctantly is transformed into Merikk Scythe, the leader of the Underground Liberation. These futuristic Seekers of absolute truth find themselves outcast by a world dominated by deadly deceit, unbelievable technology, corporate power-mongers, mysterious “helpful” aliens, and plenty of soul-ravening demons. Hopelessly outnumbered by enemies and constantly on the run, Merikk and his small band of Seekers desperately attempt to recover the ultimate talisman to defeat Evil, the Spirit Blade, Frandsen’s cognate of Arthur’s enchanted Excalibur. Frandsen then felt genuine concern that his production company’s eponymous flagship effort might likely be perceived by new listeners as less-polished than his subsequent work. Mega-movie producer George Lucas could empathize. While producing the first of three Star Wars pre-quels beginning in the mid-90’s, Lucas decided to drop an extra $15 million on spiffing up the original three chronological productions. A disproportionate two-thirds of this sum went into upgrading the 1977 Star Wars. He re-released the trio as the Star Wars Trilogy Special Edition in 1997. While the Captain has not heard the original Spirit Blade in its entirety, after listening to both the new re-mix, then moving immediately into scenes from Dark Ritual, he can affirm for you, Audionauts, that Frandsen invested his redux time … well. Both new and original fans should definitely check out Spirit Blade: Special Edition, the smart new first installment of the Spirit Blade Trilogy at spiritblade.net. You can hear Prophecy, the full first track of Spirit Blade: Special Edition, on the Audio Drama Showcase channel at captainradio.com. Also, be sure to listen to a sampling of Dark Ritual episodes here at Radio Drama Revival. Just search for “Spirit Blade”. … stay sharp! This is Captain Radio, signing off!